i got to get through 3 days of work and then im on vacation !!!!!! Everyone have a safe trip and a great time! yes safe trip pony people and see you there !!! I must agree with Gingerbread. Pics or it didn't happen! Seeing all the pics flood Facebook made me sooooo jelly. One day I'm going, even if I have to ride there on one of my real live ponies to do it. I wasn't there but my customs attended for me! 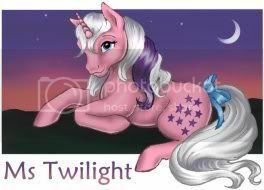 I currently have sent for sale stock customs to Enchantress and Traveling Pony Museum.